Kavumba School received a very positive report when the Catholic Schools' inspectors visited in 2015. They graded all aspects as 'good' and stated that Safari, the head teacher was doing a brilliant and conscientious job. Well done, Kavumba! In year 2015, 290 children attended our Kavumba primary school. Out of those, 251 finished the academic year and took exams, 17 children withdrew due to parents being unable to pay the small fee ($1 per month! ), 12 children were ill, and had to give up taking exams, and one child sadly died of Thypoid. 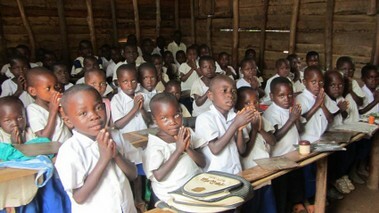 But in summary, THERE WAS AN 81% SUCCESS RATE in the year, given that 221 children succeeded at their exams. BRILLIANT!! This demonstrates the quality and dedication of the teachers, in spite of receiving no salary from the government, and only a small but regular "bonus" from congo action. It also demonstrates how much we need you, our friends and supporters, to back up our efforts to keep the school going. Without your very valuable help this school would close.